Aside from a political climb to the top of the Lega, started at the time of the Bossi-run Lega Lombarda and his 'celodurismo', the very fact that Salvini was politically formed in the Leon Cavallo leftist movement before jumping on the winner's chariot (the one going right, at least for the time being) should give us some clues about him and his deeply rooted political principles. For the time being, though, I will avoid his political past. Rather, I will lead you into Salvini's taxonomy of migration and the way in which he dichotomously categorizes migrants (except those who play for AC Milan). There are, following his home-baked categorisation, two typologies of migrants, the legal and the illegal one. This dichotomous distinction between pampering and strong migration policies is already a classic in far right populist discourse. Those who are legal may stay, those who are illegal have to leave. In principle, as he often claims in his media appearances, there is nothing wrong with this line of thought about inclusion and exclusion. By making this distinction, Salvini succeeds in giving his position a non-radical aura. In Italy, in fact, illegal residence is already a violation of the law, and it follows that the discursive slippery slope from 'illegality' to 'criminality' is opened up for traffic. Salvini's discourse, by tapping into an already existing political fact, can further radicalize anti-immigration stances and at the same time claim to be 'normal'. The distinction, on the other side, allows a far more radical discourse in which 'illegals' are 'criminals' and thus a 'threat', against which Italians need to be defended by their government. That is the implicit logic eagerly invoked by Salvini, and the fact that this logic might involve and condone violations of fundamental human rights does not seem to disturb him. The cancellation of the financing of Centri d'Accoglienza Straordinaria (CAS) suggests an extremely bleak scenario. Not only do illegals become criminal and thus they can be punished, now they are also left without shelter and without any form of social security and medical protection. It is on those grounds that the Dutch IND (Immigratie en Naturalisatie Dienst) raised its objections as well as its concerns about the fate of (unaccompanied) migrants in Italy. 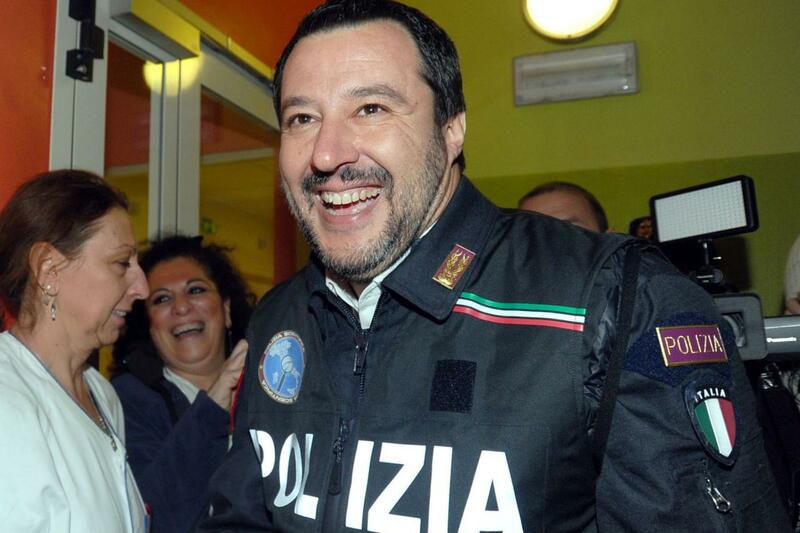 Salvini's reply was that 'in Holland, migrants are so pampered that they might even get tulips' and that legality is the only way to a secured society and to the integration of migrants. Pampering vs strong migration policies? This dichotomous distinction between pampering and strong migration policies is already a classic in far-right populist discourse. In this discourse, the stress is always on stopping as many migrants at the border as possible or on expelling 'illegal migrants' from the country. The 'legal migrants' should integrate. Let's ask ourselves, when is a migrant integrated? We can try to find an answer to this question in three ways. The first - as many integration tests do across Europe - is done by asking questions that could be right out of trivial pursuit. Questions that, among other things, I often ask my indigenous Dutch students. Do you know the Dutch constitution? Do you know why the Dutch flag has three colours? Do you know the lyrics of the national anthem (Het Wilhelmus: MS)? Astonished faces often light up my classes when I ask these questions. The strong immigration policy discourse thus not only enables the categorization of migrants as illegal, to criminalize them and to deny them their human rights, it also enables an attack on civil society and strengthens nationalism. The second way to find an answer is the one that touches upon the meaning of 'being integrated'. Can we say that a human being of origin X is integrated when he adheres to pre-established rules of social and cultural conduct such as those that are included in an integration course? And, is the obligation to know about one's own country only an obligation for the newly arrived migrant or is it an obligation for all inhabitants of a given country X? Third and last, - as often asserted by Minister Salvini - is the use of the official language of the host country as an index of the level of integration. Can one say that language proficiency is the royal way to becoming integrated? If this were to be the case, it would then be appropriate to throw a blind eye to the statistics of illiteracy that Italy champions in its adult population. The strong immigration policy discourse thus not only enables the categorization of migrants as illegal, to criminalize them and to deny them their human rights, it also enables an attack on civil society and strengthens nationalism. This strengthening of nationalism is not only an effect of creating 'non-Italian illegal' migrants, but it is also an effect of the discourse on the integration of 'legal migrants': they should become 'real Italians', whatever that may mean. Integration is often a task solely given to the 'newly arrived'. Such a claim, if there are no economic interests more important than the electoral consent, then turns into disdain and consequent denunciation of the possible danger that the 'newly arrived' may cause. It is the newly arrived who becomes the agent of his/her own misfortunes. It is again, and even more so, the newly arrived who is selected as the trigger of a country's internal instability, and it is again the newly arrived whose conduct is exposed to the moral obligation to normalize, to be a perfect Italian. This nationalistic integration-discourse is highly anachronistic in a world where for mobile diasporic people like migrants integration does not occur in one society only, but rather in a variety of networks that spread thanks to digital communication across national borders. Further, in these networks in which these migrants do participate, they integrate into different ways. For instance, by contributing to the local economy, by helping other fellow migrants, by sending remittances home, and in so doing being part of their family lives although far away. What we are faced with then when looking at Salvini's taxonomy is not only an anachronistic view of integration, it necessarily will result in fundamentally anti-humanistic policies. His policies and discourse claiming to revitalize the nation and secure its integrity will result in further undermining of the idea of universal human rights and democracy.